The first all-carbon solar cell - a game changer for mass solar? The first all-carbon solar cell – a game changer for mass solar? Hydro, biochemical and solar energy are all potent sources of renewable power, but they are yet to be scaled-down to the point where affordable mass production is possible. One of the critical reasons why solar energy is not readily available is because its component materials are not in abundant supply - until now. One of the most basic components of solar devices are solar cells. Stanford University scientists have developed the first solar cell made entirely out of carbon. Image courtesy of Mark Schwartz. Other less costly materials in solar devices, such as indium, are becoming increasingly scarce. Zhenan Bao, a professor of chemical engineering at Stanford, is the study's senior author. One of the most basic components of solar devices are solar cells, also known as photovoltaic cells. These cells, which convert light into electrical energy, can generate a sustainable source of energy without the need for the attachment to external voltage sources. Stanford University scientists have developed the first solar cell made entirely from carbon, offering a promising alternative to the expensive materials used in photovoltaic devices today. "Stanford University scientists have developed the first solar cell made entirely from carbon." Photovoltaic cells have significantly increased production and associated base costs in comparison to other energy sources, such as coal and oil. Although modern developments have vastly improved energy efficiency, most cells remain dependent on the base material of silicon, with the processing of silicon materials being both lengthy and expensive. Silicon materials require a certain degree of purity in order to be effectively utilised and must undergo several coating processes. in order to be fit for usage in the photovoltaic process. Other, less costly, materials in solar devices, such as indium, are increasingly becoming scarce since these are also used in hardware, such as phones, tablets and other modern gadgets. Fortunately, senior Stanford researcher and chemical engineer, Professor Zhenan Bao, believes that: "Carbon has the potential to deliver high performance at a low cost." Michael Vosgueritchian, co-lead in this groundbreaking study, adds that carbon produces fewer manufacturing and production costs. "Processing silicon-based solar cells requires a lot of steps," Vosgueritchian explains. "But our entire device can be built using simple coating methods that don’t require expensive tools and machines." Professor Bao reinforces the economic value of all-carbon solar cells, stating that: "Carbon is one of the most abundant elements on earth, and it is versatile." So, while carbon solar cells may not replace silicon-based cells at the moment, it is hopeful that they will serve as a reasonable alternative in the future. "The goal of this project was to develop carbon-based materials as transparent electrodes for solar cells," explains Professor Bao. "The reason for that is that carbon-based materials are very abundant in nature and they have extraordinary light absorption properties." "Silicon materials require a certain degree of purity in order to be effectively utilised and must undergo several coating processes." She further explains that: "We started this programme working with carbon nanotubes, they have extraordinary conductivity, and also at the same time they can be dispersed into solution so that we can potentially coat the materials onto surfaces." Stanford scientists used carbon allotropes for the three major components of the solar cell: the anode, cathode and active layer. The traditional solar cell uses electrodes made of conductive metals and indium tin oxide, but the scientists at Stanford substituted silver and indium with graphene, a very narrow and light substance made of pure carbon. Indeed, a one square metre sheet of graphene could weigh as little as 0.77 milligrams. They used materials made of carbon nanotubes for the active layer, which is a significant change from the developments that other researchers have claimed to have made in efforts to improve energy efficiency. According to Vosgueritchian: "Every component in our solar cell, from top to bottom, is made of carbon materials." He adds that: "Other groups have reported making all-carbon solar cells, but they were referring to just the active layer in the middle, not the electrodes." "Scientists at Stanford substituted silver and indium with graphene, a very narrow and light substance made of pure carbon." While solar cell efficiency from silicon-based materials can vary from as low as six percent to as high as 42.8%, high solar cell efficiency does not necessarily translate into a better economical choice. Solar cells with the highest efficiency ratings can cost a hundred times the base cost of solar cells that might operate at eight percent efficiency. Most commercially available solar cells have conversion ratings from 14 to 19%. 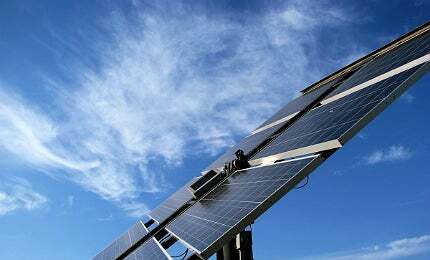 Shengjiang Ren, assistant professor of chemistry at the University of Kansas, claims that carbon solar cells must be able to reach the ten percent efficiency threshold in order to be commercially viable. Currently, during these early stages of research, the all-carbon photovoltaic cells can convert less than one percent of the energy in light into electricity. However, Vosgueritchian believes that the advanced ability of carbon photovoltaic cells under extreme conditions, in comparison to other materials, could outweigh the need for greater efficiency. Professor Bao supports this, stating: "Materials made of carbon are very robust. They remain stable in air temperatures of nearly 1,100°F." Professor Bao is confident that the carbon solar cell can be made more efficient by utilising better processes, as well as via the use of other types of carbon nanomaterials. The use of carbon nanomaterials is still relatively new and untested and there is extensive ground to be gained from perfecting the processes involved in using these materials. However, just as the first silicon solar cell was only able to reach conversion figures of one percent, it is also likely that the all-carbon solar cell will soon be able to reach better conversion figures. In the meantime, the Stanford scientists behind this innovative research have filed a patent on the entire device, and there are high hopes that the creation of the first all-carbon solar cell could mark the beginning of finding a more reliable and economical source of power. Tokelau, an island nation in the South Pacific, is now completely able to support itself with solar energy. Solar CPV records broken – but can innovation trump mass manufacture? Records are being broken almost monthly in the concentrated photovoltaic (CPV) solar power market, but at the same time manufacturing plants are being shut down and big players are struggling to compete with their cheaper Chinese counterparts.